In “Common Sense Horsemanship”, published in 1951, V.S. Littauer continues to teach beginners to place the hands on the crest or hold the mane beginning 3 or 4 strides before the jump. In the same book he has riders move their hands to the sides of the neck as they become better riders. There were several other important authors of books on jumping during this same period, including Harry Chamberlin, Capt. Piero Santini, and Benjamin Lewis. None of these authors advocated using the hands to balance or support the rider during jumping. They all advocated what we call the “automatic release” or ‘following hand’ today. instructed Jane Marshall Dillon, author of the popular books “School for Young Riders”, published in ’58 and “Form Over Fences” published in ’61. Ms. Dillon advocated that beginners hold the mane, intermediates take support from the sides of the neck and advanced riders “follow through the air” with their hands while jumping. One of Ms. Dillon’s notable students was Olympic Gold Medalist, Joe Fargis, who is actively involved in the ANRC. (http://www.anrc.org/ ). Joe Fargis is the rider in the video posted with this blog. Men Like Federico Caprilli, Piero Santini, and Harry Chamberlin, devoted a major portion of their lives to riding . They had the opportunity to ride for many hours, every day. Chamberlin had a captive audience via the cavalry. Capt. Littauer was a public instructor in New York. He recognized that the majority of people that he taught would never be able to put the hours of practice into their riding that men in the cavalry did, so he began to look for other methods to help them achieve their riding goals. He taught that leaning on the horse’s neck was preferable to jabbing the horse’s mouth, but he still maintained that the goal was to have a following hand. The dismounting of the Cavalry in 1943 had a huge effect on American riding. Up to that time the U.S. International teams had been made up of Cavalry officers and the School at Ft. Riley had been an Equestrian “think tank”. In its day, the Cavalry School at Fort Riley was the best in the world. After WWII, the public riding community, including horse shows, grew in leaps and bounds. 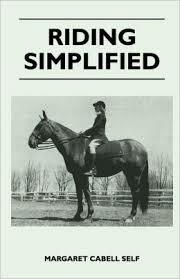 In the ’50s several instructors wrote books that broke riding into levels (beginner, intermediate, advanced). The books describe graduated methods for the use of hands over fences. 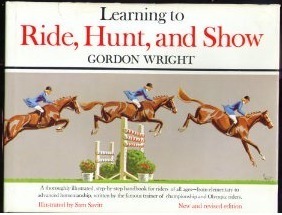 In his 1950 book, “Learning to Ride, Hunt and Show”, Gordon Wright teaches the beginner, who is just learning to trot, to put his hands halfway up the crest, in the mane and to put the weight of his upper body on the hands and the horse’s neck. Gordon Wright teaches that leaning the upper body on the hands is the correct jumping technique for the beginner and intermediate rider, but that advanced riders should strive to “jump out of hand”. 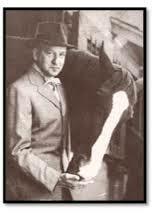 Gordon Wright and Vladamir Littauer were contemporaries, both living in New York . They were both public instructors with students bound for the show ring. It’s not a stretch of the imagination to believe that the two men communicated about teaching methods. Capt. Littauer was known to discuss horsemanship and techniques into the wee hours of the morning. It was his passion. George Morris, student of Gordon Wright, freely admits that he copied his teaching “system” from Gordon Wright. “Hunter Seat Equitation” is a close copy of Wright’s system, but George Morris adds some elaborations. Instead of beginner, intermediate and advanced riders, George Morris labels 3 levels of riding, each characterized with it’s own “release” for jumping. Mr. Morris teaches First Level riders to grab the mane “halfway up the crest” three or four strides before the jump. He teaches us 3 “technically correct” ways to grab mane. This is called the “long release”. In the revision of “Hunter Seat Equitation” Mr. Morris changed the long release to 1/3-1/2 of the way up the horse’s crest. Second Level riders should rest their hands firmly on the top of the crest, the last stride or two before the jump. This is the first step toward jumping out of hand. The rider rests the hands on the mane 1/3 of the way up the crest for the “short release”. (pg 110). In the revision of “Hunter Seat Equitation”, Mr. Morris changed the position of the short release to 1-2 inches past the withers. George Morris teaches the level 3 rider to “jump out of hand” which is synonymous for automatic release. It’s safe to say that the crest release has been an evolving process that grew out of the need for an easier way to teach jumping. None of the authors who supported teaching the crest release in its various forms ever meant for it to become the end all of riding. George Morris did not create the crest release. He named it. Finally, in “The American Jumping Style” 1993, the crest release becomes official when George Morris labels the releases as short crest release, long crest release, automatic release (jumping out of hand). Friend or Foe? Good or Bad? The crest release has been a friend to the American rider- or has it? It certainly has made it possible for riders to get into the show ring faster and it has allowed many riders to reach significant levels of competition. But what has it done for the overall quality of horsemanship in the U.S? interesting that the earlier advocates intended the crest release to be strictly for beginners. i also find it interesting that many proposed placing the hands on the sides of the neck rather than on top of the mane – in this position it seems more natural to transition to a following hand, where the two could become interchangeable as the situation allowed. The primary difference can be seen as the shift from full time riders – the Cavalry – to part time, even if “professionals.” The psoas muscles and lower truck must be massively strong to do the jumping out of hand. In a sense, even today’s more “advanced” riders might be beginners in the sense of the number of hours spent in the saddle compared to those who truly lived and made their living on horseback. The “system” is designed to teach postures and principles that have become increasingly separated from the daily efforts of people. Once the work of daily life was exercise and fitness enough; today some pay to go to a gym to exercise after a day of sitting at a keyboard. You are quite right about the change of emphasis in our culture. It’s too bad. On the other hand, if we teach a crutch and then elevate it to the status of a tool will our riders ever be motivated to pay the price to stretch themselves. Jumping out of hand – using an automatic release- correctly gives a rider a terrific feeling of balance and oneness with the horse. And in addition to muscle tone, it really takes a good base of support, flexibility, and balance. The idea of grabbing the mane as a beginner was to protect the horse’s mouth and their back. It also gave the beginner confidence to jump small jumps or creeks and improve their riding. Many horses, I am positive are so thankful for this method for beginners! Bob mentioned the number of hours spent in the saddle by today’s riders compared with riders of the past who made their living on horseback. What surprises me is that no one in today’s “hunter” world seems to ever mention hunting. When I was a child, the hunter world was made up in large part of people and horses who actually hunted. And there are still parts of this country where people hunt more than one day a week. But it seems to me that most people who show “hunters” nowadays never hunt, and people who hunt don’t show hunters. I don’t know why that happened, or how, but it seems a pity if people who show hunters aren’t out there in the actual field putting in long hours in the saddle acquiring the skills and fitness that make for better riding and better horsemanship including good hands and the seat that “aids” the hands.